Praying with beads is an ancient spiritual practice, finding a home in many spiritual traditions. It is a practice that integrates our body, mind and spirit in intentional prayer, helping focus our minds on prayer by adopting a bodily practice, and connecting us with all creation. The Anglican Rosary adapts this ancient tradition and makes it distinctively Anglican – from its emphasis on creation to the ability to adapt it in a personal way. Four Cruciform Beads—remind us that the Cross is the central symbol of our Christian Anglican Faith, as well as reminds us of the seasons of the temporal year and the four points on the compass, thus bringing us into mindfulness of the created world. Invitatory Bead—Just as the Daily Office of the Church begins with the Invitatory, the bead just above the Cross is an invitation to praise and worship God as well as an entry point into the circle of prayer of the rosary. 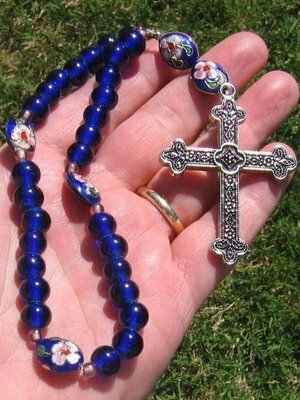 The configuration of the Anglican Rosary relates contemplative prayer to several levels of traditional Christian symbolism. Contemplative prayer is enriched by these symbols whose purpose is always to focus and concentrate attention, allowing the one who prays to move more swiftly into the Presence of God. The use of the rosary or prayer beads helps to bring us into contemplative prayer, really thinking about and being mindful of praying, of being in the presence of God by use of mind, body, and spirit. The touching of the fingers on each successive bead is an aid in keeping our mind from wandering, and the rhythm of the prayers leads us more readily into stillness. To begin, hold the Cross and say the prayer you have assigned to it (most often The Lord’s Prayer), then move to the Invitatory Bead. Then enter the circle of the rosary with the first Cruciform Bead, moving through the Weeks and the other Cruciforms, saying the prayers for each bead, and then exiting by way of the Invitatory Bead and the Cross. It is suggested that you pray around the circle of the beads three times (which signifies the Trinity) in an unhurried pace, allowing the repetition to become a sort of lullaby of love and praise that enables your mind to rest and your heart to become quiet and still. A period of silence should follow the prayer, for a time of reflection and listening. Listening is an important part of all prayer. Begin praying the Rosary by selecting the prayers you wish to use for the cross and each bead. Practice them until it is clear which prayer goes with which bead, and as far as possible commit the prayers to memory. Find a quiet spot and allow your body and mind to become restful and still. After a time of silence, begin praying the Rosary at an unhurried, intentional pace. Complete the circle of the beads three times. When you have completed the round of the Rosary, you should end with a period of silence. This silence allows you to center your being in an extended period of silence. It also invites reflection and listening after you have invoked the Name and Presence of God. The Cross: Our Father, who art in heaven, hallowed be thy Name, thy kingdom come, thy will be done, on earth as it is in heaven. Give us this day our daily bread. And forgive us our trespasses, as we forgive those who trespass against us. And lead us not into temptation, but deliver us from evil. For thine is the kingdom, and the power, and the glory, for ever and ever. Amen. The Invitatory: Let the words of my mouth and the meditation of my heart be acceptable in your sight, O God, my strength and my redeemer. Oh, Lamb of God, that taketh away the sins of the world have mercy upon us, Oh, Lamb of God that taketh away the sins of the world have mercy upon us, Oh, Lamb of God that taketh away the sins of the world give us Thy Peace. The Weeks: Almighty and merciful Lord, Father, Son, and Holy Spirit, bless us and keep us. Amen. The Cross: Glory to the Father, and to the Son, and to the Holy Spirit. as it was in the beginning, is now, and will be for ever. Amen. The Invitatory: Open my lips, O Lord, and my mouth shall proclaim Your praise. The Cruciforms: Guide us waking, O Lord, and guard us sleeping; that awake we may watch with Christ, and asleep we may rest in peace. The Weeks: Jesus, lamb of God, have mercy on us. Jesus, bearer of our sins, have mercy on us. Jesus, redeemer of the world, give us your peace. The Cross: In the name of God: Father, Son and Holy Spirit. The Invitatory: Oh God, make speed to save me. Oh Lord, make haste to help me. Glory be to the Father, and to the Son, and to the Holy Spirit. As it was in the beginning, is now and will be forever. Amen. The Cruciforms: Bless the Lord, my soul, and Bless God’s holy name. Bless the Lord, my soul, who leads me into life. First Week: Adoration: Say prayers of praise on each of the seven beads of the week, such as the Doxology: Praise God, from whom all blessings flow, Praise God, all creatures here below, Praise God above, ye heavenly host, Praise Father, Son and Holy Ghost. Amen. Second Week: Confession: Lord Jesus Christ, Son of God, have mercy on me, a sinner. Ask forgiveness for sins committed in thought, word, and deed; for doing what you ought not to have done; for leaving undone what you should have done; for not loving God with your whole heart and for not loving your neighbor as yourself. Name any sins that come to mind. Ask God to forgive you in Jesus’ name. Third Week: Thanksgiving: Thanks be to God for all blessings God so richly bestows. Say prayers of thanks on each of these seven beads. Fourth Week: Supplication (Intercession): Holy God, holy and mighty, holy immortal one, have mercy upon us. Supplication: say prayers of request, intercession, etc., for yourself and others, on each bead of the last week. Final: Oh God, let your holy angels have charge of us, that the wicked one have no power over us, in Jesus’ name. Amen. I will bless the Lord. Thanks be to God! The Invitatory: Holy God, Holy and Mighty, Holy Immortal One, Have Mercy upon me. The Cruciforms: O God, make speed to save me, O Lord, make haste to help me. Glory be to the Father, and to the Son, and to the Holy Spirit. As it was in the beginning, is now, and will be for ever. Amen. The Weeks: Lord Jesus Christ, Son of God, have mercy on me, a sinner. Final: The Lord’s Prayer. I will bless the Lord.